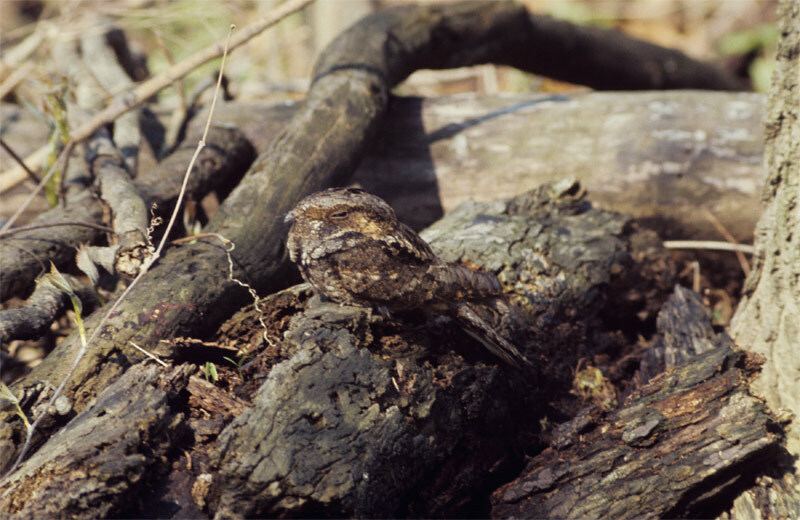 This medium-sized (10 inch) member of the nightjar family is seldom seen but well known for its trademark call, a three part “WHIP-poor-WILL” with rising last note and first and last syllables accented. During the breeding season, it can be heard calling its name over and over, seemingly endlessly, at dusk and dawn. It is very well camouflaged; coloured in browns, black, and gray. Its beak is very small but it has a large mouth fringed with long stiff bristles that aid capturing insects. Whip-poor-wills long rounded tail and rounded wings. They forage at dusk, dawn, and moonlit periods of the night and catch flying insects, especially moths and beetles. The whip-poor-will lays its eggs in phase with the lunar cycle, so that the eggs hatch on average 10 days before a full moon. When the moon is near full the adults can forage the entire night, and provide the nestlings with insects. Pairs usually raise two chicks, with the eggs laid on leaves on the forest floor. They do not construct a nest. Chicks begin to move about quickly and leave their birth site shortly after hatching. They overwinter from South Carolina and along the Gulf of Mexico to Guatemala. They return to central Ontario by mid May. Whip-poor-wills breed in deciduous or mixed forests with little or no underbrush. This is another example of the disappearing formerly common insect eating birds of North America. It is unclear why they have declined. Habitat loss, environmental contaminants, and possibly effects of climate change. With weather patterns becoming more erratic, this may affect the timing of some species’ return to breeding grounds and making them more susceptible to poor weather conditions on their return, or their breeding cycles may no longer be timed to coincide with peak insect hatches. Please keep your cats indoors. Cats are particularly hard on ground nesting birds. Support sustainable forestry practices when you purchase wood products. Look for an FSC logo.